How you choose to finish your presentation with style and panache is pivotal to successful presenting. Your opening comments aim to grab the attention of your audience. However, it’s your closing comments that keep the attention. And, furthermore, they will keep the main points of your presentation or speech in your audience’s memory. Your presentation’s conclusion can take many forms. But one thing is certain. It won’t be rushed; it’s your final opportunity to make your points memorable and it’s got to be thought through. So, to help your planning we’ve listed the five main ways that you might use to finish a presentation. Most presenters will use a combination of at least two of these when they conclude. With some practice and self-training you can do the same. In a summary you re-emphasise all the key points that you have already made in your presentation. You re-emphasise their importance. You re-establish their relevance to your audience. In the same vein, a winding-up conclusion pulls together the main strands of your presentation, shows their mutual connection to one another; and then confirms their importance and relevance. A thesis summary, similarly, re-makes the key points of your argument and confirms their validity. This Nick Clegg green speech is a good example. A call to action is used when you want your audience to do something. So, if the aim of your presentation is for your audience to do something tangibly different—after listening to your presentation—then now’s the time to say it. Again. If you are looking for “commitment”, an order or a contract, then ask for it. You can see this in action with the David Cameron Scotland speech. An inspired conclusion involves you telling a story, anecdote or quotation to make your final point. Therefore, if you aim for your audience to do something then an illustrative anecdote could be right for you. If you want to summarise, then a quotation—amusing or historical—might work. In all cases your choice of illustration is key. Inspiration requires a certain tone. Ed Miliband tried this approach with a New Year speech at the Oxo Tower in London. A humorous finish might involve you telling a story or an anecdote to illustrate your major point from an alternative perspective. It’s a useful means to show how others might have wrestled with the point, made light of it, but still recognised its value. To see how this works, you can take a look at the Archbishop Dolan speech, where he mixed a story with humour in his conclusion. A reference closing refers to a date, an event or an external happening to set your presentation in a wider context and reinforce its relevance. Your task is to set your presentation in a wider frame of reference—politics, business, or sporting history. It’s very similar to the opening reference approach. You could use it to start and finish your presentation. 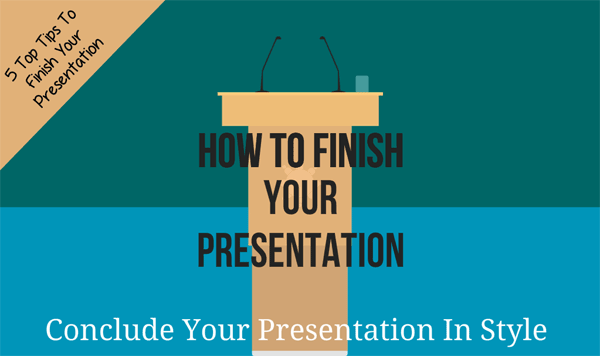 5 Top tips showing you how to finish your presentation. Re-emphasise all your key points. Inspire with a story, quotation or anecdote. Use a historical reference for context. Finishing your presentation well requires some work and training. But that work is worthwhile. Because you don’t want to revert to this PowerPoint presentation shortcut. It’s not a good solution. So, you have the opportunity to boost the collective memory of your presentation among your audience. And that’s your aim when you finish your presentation. For more presentation skills tips and other ways to finish your presentation you can always join a presentation course. You can join a public course at one of more than 40 presentation training centres. Or, as an alternative, why not ask us to run a course at your place of work. Because a tailored course could be just right for all your team.